As Mizzou football prepares to start a new season, once again Tiger fans will expect big things of their team — and the rest of the football world will not. In spite of winning 12 games and the SEC East last year, nobody seems to respect the Tigers. The league’s Sports Information Directors pegged MU ninth best in the league in their preseason ratings, while the poll of reporters at SEC Media Days picked the Tigers fourth in the Eastern Division — which Mizzou won last year. 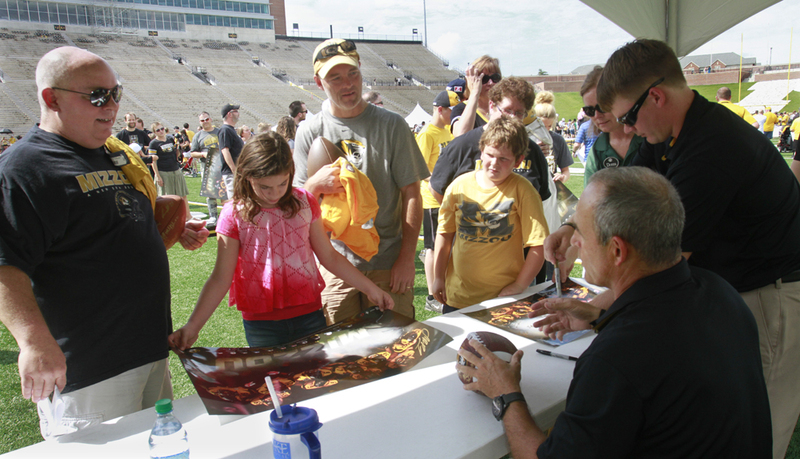 MU football coach Gary Pinkel, right, with back to camera, talks with fans at the annual Fan Day event on Sunday, Aug. 10, 2014, at Memorial Stadium. Pinkel is entering his 14th season at Missouri and is the school’s winningest coach. This isn’t terribly unexpected. Missouri is new to the SEC and its long road of success against the Big 12 is seen by many in the Deep South as having been accomplished against “inferior” competition. That Missouri beat such “inferior” teams as Nebraska, Oklahoma, Texas A&M, Oklahoma State, Texas and so on during its years in that other league seems to mean nothing to people who think there’s SEC football and everything else is a pale comparison. And because of the Tigers’ losing record in 2012, there will be those who see last year’s championship as a fluke. It’s going to take a long time for that to be overcome. 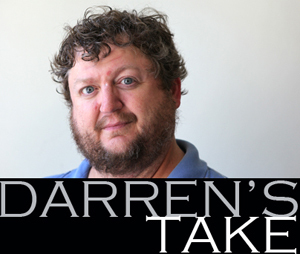 But there’s another part of this that goes even beyond the others, and has a good-sized sect of believers within Missouri, and that is a lack of respect for what’s been accomplished by Gary Pinkel. A man whose accomplishments have earned him a place among college football’s elite isn’t just overlooked nationally among discussions of the best coaches, he isn’t even seen as being a great among many Tigers fans. Gary Pinkel became the winningest coach in Mizzou history last season but one has to have a historical perspective to really see what that means. “Winning more than anyone in Missouri football coaching history” puts Pinkel in league with some of the giants of gridiron history. Don Faurot isn’t just the name of a stadium and a guy they have a statue of — he was truly one of the game’s greatest innovators. The move from the single wing to the split-T formation of his own invention changed football drastically for many decades. His option football made winners of teams with guys that weren’t the biggest or most athletic players. It evolved into the offensive style that made powerhouses of Texas, Alabama, Oklahoma, and many others. In our pass-happy 21st century, not only is option football still around in high school football and colleges, it’s starting to become hip in the NFL again on teams such as Buffalo. Much of what seems very new and shiny in the pistol offense is, in fact, taken straight out of the play of the old split-T. Faurot isn’t just a Mizzou legend, he’s a football legend. Dan Devine, who followed shortly after Faurot (many don’t know that longtime Arkansas coach Frank Broyles coached at MU for one season before heading to Fayetteville) is also a Hall of Fame coach. A lifetime record of 173-56-9 puts him as one of the best coaches ever. A solid argument could be made that his 1960 team was worthy of a national championship, especially since the team’s one loss was later forfeited back to Missouri. His ’62 team lost just once, and two other Tiger teams finished with only two losses. He left Mizzou for a job with the Green Bay Packers, and later Notre Dame. But of at least equal note is what Pinkel has accomplished here. Not only has he won more games (102-63) than either Faurot or Devine at Missouri, but he rebuilt a program that was pretty darn awful. Now, I’ll start with this acknowledgement—Larry Smith (143–126–7) was a hell of a good coach and will never get enough credit in discussion of rebuilding Missouri football from nearly two decades of losing. But Smith’s best single-season record was 8-4, his crowning achievement was a win in a minor bowl game, and his final two teams at MU were a combined 7-15. And those were high points between 1984, Warren Powers last season, and Pinkel’s arrival in 2001. Youngsters whose memories of Tiger football don’t go any further back than Brad Smith have no idea how low the program had sunk. Missouri football was a jolly joke. Fans lived through four dreadful seasons on Woody’s Wagon. That season in ’90 that almost got interesting when the Tigers upset a strong Arizona State team, only to suffer—the Fifth Down. Losing 32-0 to a Kansas State team that hadn’t been any good since Adam and Eve were dating in high school, losing an opener to Tulsa, and some truly gruesome beat-downs including one that always sticks in my mind, a 73-0 loss to Texas A&M. When Smith won four, and then three games to finish his time in Columbia, a relatively new director of athletics named Mike Alden gave us Gary Pinkel, and nobody rushed down to Providence Road for a celebration parade. Another coach from a mid-level team (Toledo) and more frustration and losing is what most anticipated. And at first, that’s what they got. Pinkel’s first two teams had losing records—a cautionary tale to my friends in Gainesville and other places where one losing season brings out the “fire the coach” calls. His team then won eight before losing the Independence Bowl and then responding with another losing season. Were this to happen today, Pinkel probably would have been tossed on the heap with Smith, Bob Stull, Woody Widenhofer, and all those other guys who tried and failed to make something of Missouri football. But Alden’s shown over the years the tendency to be patient with coaches on the proverbial “hot seat,” and this time it paid off (it rarely has failed to do so.) Missouri returned to the Independence Bowl in 2005, and in 2006 won eight behind new quarterback Chase Daniel and a bunch of guys the “experts” ranked as two or three-star recruits. Alden stayed committed to his coach, and that coach remained committed to his system. And then it really clicked. Missouri won the Big 12 North three of the next four seasons with 40 total wins. Missouri football had changed and Pinkel changed it. Not on his own, mind you. As long as there have been great and famous head coaches, there’ve been unrecognized assistants. Faurot had Harry Smith and Chauncey Simpson and John “Hi” Simmons (yes, the legendary Tiger baseball coach also was an assistant football coach.) Devine had Smith, Clay Cooper, and of course the beloved “Mister Mizzou” John Kadlec. And Pinkel would be the first to tell you he’d be nothing without Dave Steckel, Andy Hill, David Yost, Matt Eberflus, Dave Christensen and a long list of other great assistant coaches. Pinkel seems quite authentic when he says he doesn’t keep track of numbers like career victories. He has the appropriate respect for Faurot and Devine but breaking their record and becoming the winningest coach in Mizzou history didn’t seem to make much of an impression on him. One even doubts he’ll take that much notice of the fact that his first victory in 2014 will be his career win number 176, which will move him into a tie with Frank Kush for the 30th most wins of any coach in football history. It won’t mean much to him that he’ll have passed a fabled SEC coach, Ralph “Shug” Jordan of Auburn fame. But I hope at some point then, as his focus turns towards the next week’s opponent, that it will occur or be mentioned to him that he also passed Don James with win number 176. For as non-sentimental as Pinkel is, his love and respect for James, his coach at Kent State and mentor at Washington, cannot be denied. He won’t tell us it’s a big deal to him, but I hope he realizes that it is. For the last eight seasons Missouri has averaged more than nine wins a year. If the now-62 years old Pinkel coaches just five more years, it’s a safe bet that he’ll move pretty high on the list of all-time wins. With just eight wins a year, he’d pass some big names (many of them the giants of SEC history)—Darrell Royal. Johnny Majors. John Vaught. Vince Dooley. Woody Hayes. Pinkel has, rather quietly, not only run up a historic number of victories, but did so while turning around a program that was, to put in bluntly, in the dumps. Think it was easy? Widenhofer has four Super Bowl rings. Stull’s last UTEP team won 10 games, and he’s still the athletic director in El Paso. Larry Smith turned around losing programs at Tulane and Arizona and won a Rose Bowl with USC. These were good coaches. All tried to turn things around at Ole’ Mizzou and they all failed to do so. It’ll take a while for SEC watchers to acknowledge anything associated with Missouri has much value to it. And of course, the folks in that conference we left behind won’t give anything in black and gold the time of day. 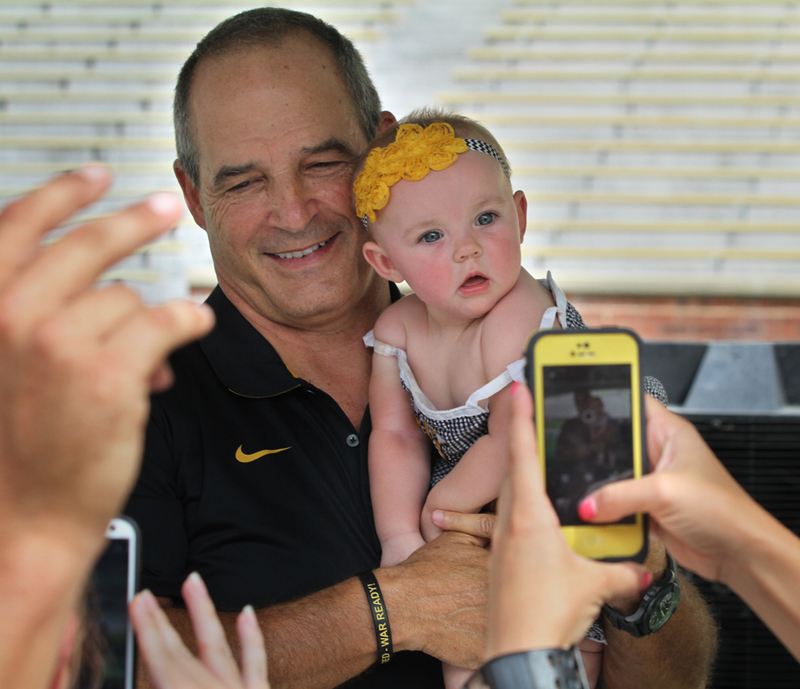 In 49 states, the legacy of Gary Pinkel may never be truly recognized or acknowledged. But here in the Show-Me State, I do hope Tiger fans realize what we’re seeing each Saturday in the fall on the sidelines. And that is, like predecessors Faurot and Devine, one of the best to ever coach college football.